India set its fiscal deficit target for 2018-19 at 3.3 percent of gross domestic product, Finance Minister Arun Jaitley said. 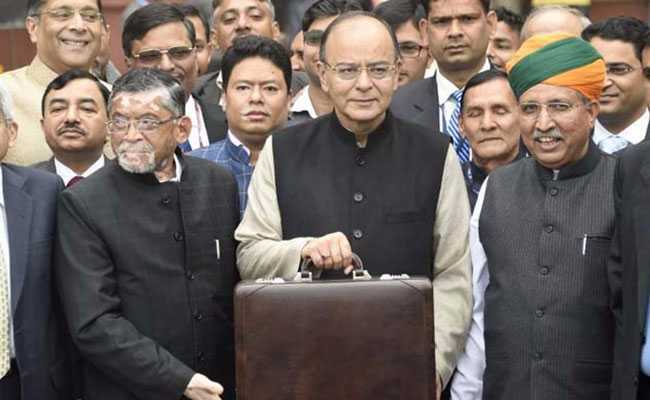 Mumbai: India set its fiscal deficit target for the year starting in April at 3.3 percent of gross domestic product, Finance Minister Arun Jaitley said on Thursday while unveiling the government's annual budget. Most analysts had expected the 2018/19 to be set at 3.2 percent of GDP. The deficit target for the year ending in March 2018 was also revised to 3.5 percent of GDP. "The government should be commended on sticking to fiscal discipline. While a small amount of slippage did occur, the larger point is that populist measures have been avoided, and all initiatives are centred around development, growth. The other notable point was the reduction in corporate tax rates for MSMEs (medium and small enterprises)." "On LTCG (long-term capital gains) tax, the government chose to rationalise tax structures across asset classes. Given the strong inflows the equity markets have witnessed, the government made a rational decision to make tax structures uniform across various investments." "On the fiscal deficit front, although the slippage for FY18 and FY19E is higher than anticipated, it will still be among the lowest levels of deficit seen in the last three decades. Therefore, the move should be viewed as a pause, and not a deviation from the path of fiscal consolidation. At this point of time, focus on economic growth is desirable." "All-in-all, it was a business-as-usual budget for India and a great one for Bharat (rural India). The Government did what it thought necessary to boost revenue, revive growth and get election-ready." "On one hand the government wants Indians to move towards financial instruments, but LTCG tax will hit savers badly who were shifting to financial assets. This will give a fresh impetus to immovable property and gold again." "Foreign Institutional Investors (FIIs) would have additional compliance since now they would have to pay tax because LTCG is back. They also have no recourse to the Singapore and Mauritius treaties which helped them to avoid capital gains tax." "The National Health Protection Scheme announced is a great move to bring health insurance to almost 40 percent of the population and a move towards universal health insurance. The merger of three public sector general insurance companies and listing them is welcome. Full details are awaited." "We welcome the announcement on custom duty increase in mobile phones from 15 percent to 20 percent. This will provide a big boost to the Make in India campaign by the government, and will be instrumental in achieving our country's vision of making India a global hub for mobile phone manufacturing. Local manufacturing will create more job opportunities, benefiting the youth and contributing towards the overall growth of the economy." "A good last budget before the elections though the fiscal deficit at 3.5 percent was definitely higher than expected. The rural and farmer focus was expected and necessary. Other than a knee jerk reaction, equity market will not be impacted in the medium and the long term as it is still the only real investment opportunity available." "This is one of the most populist budgets. If the government means to implement all the social, rural and infrastructure expenditure plans at very small changes on the tax front, I certainly have some concerns for the fiscal deficit target for the next year." "We have seen inflation coming up in the last couple of months. Increase of the minimum support price for some of the crops has the potential to increase inflation rate going forward. I don't see scope for an RBI (Reserve Bank of India) rate cut." "Increased allocation for infrastructure projects such as national highways and Bharat Mala (river linking) project in the union budget should give a much needed push to the (auto) sector, especially medium and heavy commercial vehicles. Good rural focus will primarily help to boost retail growth in the rural market and thereby bring more growth in the auto industry." "Things like hot spots for rural areas, fibre connectivity, emphasis on artificial intelligence - all of those go forward as positive in terms of pushing forward the 'Digital India' programme. However, disappointment lies in the fact that although resources are being allocated for infrastructure such as railways, the most important infrastructure element, digital highway, that is going to allow the digital economy to flourish, was unaddressed." "We remain disappointed that the concerns of the telecom industry with regard to financial help, reduction of levies, reduction of duties were not addressed." "While the budget indicates a pause in fiscal consolidation, its countercyclical measures augur well for growth. Increased emphasis on agriculture, rural and MSME sectors is most appropriate, as these sectors had suffered most due to demonetisation and GST. If implemented well, this budget carries the promise of reviving the economy in FY2019." "Infrastructure sector got a further boost through increased allocations. Thrust on large infrastructure schemes and projects continue with rail and road sector getting an all time high allocation, but the announcement to rationalise key linkages including 'coal for power' and 'power for rail' seems to be an important move." "The industry did expect some drastic measures to revive the private sector participation and improving operational efficiencies in the sector, but this has not been addressed." "Overall measures have very strong social sector emphasis, which covers agricultural and rural sectors all the way to health and education sectors. Simultaneously, there is focus on infrastructure as well." "As early as Aug-Sept last year, as the fiscal numbers were coming in, we were expecting a slippage in this target. But it has panned out. The bond market had expected fiscal slippage, I think it has not been as wide as feared." "Divestment is expected to be much better than targeted for the first time in many years." "We were expecting (fiscal deficit of) 3.4 percent for the current year and 3.2 percent for the next year, and these announcements are slightly higher than expected. This is slightly negative forbond markets." "The long term capital gain is a singular negative thing for the stock markets." "With the agrarian crisis and unemployment situation, these kind of policies are expected with or without elections." "It was no surprise to us that they relaxed the deficit targets. It looks like the BJP is aiming to shore up support among rural voters, there have been plenty of measures announced to boost the rural economy. These are quite trademark things ahead of an election." "In cumulative terms, the deficit has already overshot the previous target, it had to be revised up, but it does need to demonstrate some kind of fiscal prudence. The deficit this year will be same as last year, I don't think that comes as a surprise."